It’s that time of the year! Join us at Darwin’s Cafe for a showing of classic holiday movies! Popcorn, cookies, cozy beverages and more all available for purchase at the cafe. Come hang out among the magical Winterlights as a backdrop and enjoy one of your favorite holiday movies with the community! 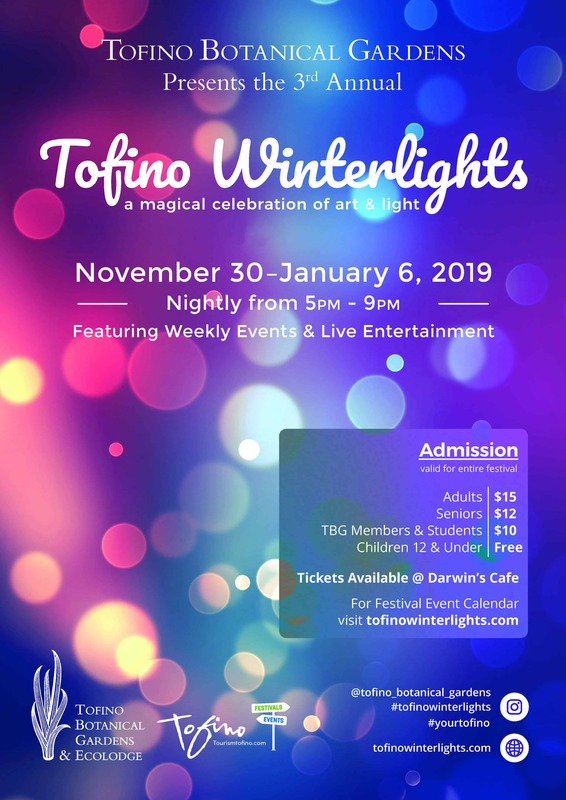 Tofino Winterlights is back! 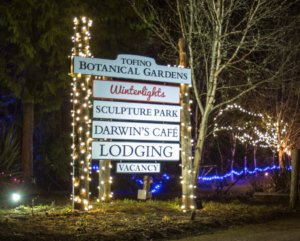 Presented by Tofino Botanical Gardens, Winterlights is a celebration of light and art that runs November 30th to January 6th! Come be enchanted by the whimsical holiday exhibits created by thousands of twinkling lights in these gardens with winding rainforest paths and creative all-weather art installations! This is a family-friendly event, with drinks and treats available for purchase in the cozy Darwin’s Cafe. There will also be a schedule of live entertainment and children’s activities! Buy your Winterlights pass, and get access to $10 yoga classes with Tofino Yoga throughout the festival (that’s $4 off per class)! Classes are in the Ecolodge classroom upstairs, Wednesdays at 7:00pm, Saturdays and Sundays at 10:00am. Drop ins are welcome!